I shudder when I hear people ridicule the idea of global warming. In the face of overwhelming evidence, they strike me as flat earth mentalities, superficial, and therefore menacing, for surely climate change poses the greatest challenge of our time, with our very survival at stake. The effects of climate change are already packing a devastating punch, with sea levels rising steadily. Soon many nations may find themselves resorting to, excuse my phrase, “a Dutch treat,” in desperate attempts to dam the invasive salt tides out. Holland, after all, knows a thing or two about sea inundation and leads the world in coping technology that famously includes robust dykes and picturesque windmills. Despite this, its infinite efforts proved futile in 1953 when storm surges overwhelmed Dutch barriers, drowning 2000 people. Today, Holland is more ready than ever with higher, more massive barriers, establishing deltas of frontal protection for coastal cities like Rotterdam and state-of-the-art early warning systems, replete with precision evacuation plans. New Orleans? (Katrina); New York? (Sandy). With increased urbanization, Rotterdam is even talking about “floating houses,” i.e, houseboats, encompassing 120 acres. Hey, scarce wonder I admire this tiny nation with colossal mindfulness. But not all countries have the resources of the Netherlands to pull it off, which means certain disaster for many undeveloped countries, especially in Africa. But none of us is outside the box either, no matter who we are, or where we live, for we live as part of a delicate ecological weave of cause and effect. Throw a stone into a pond and you’ll get ripples. That stone is global warming, abetted by human callousness. Now the ripples of severe heat, drought, forest fires, floods, disease, and food reduction are readily evident, commensurate with incipient streams of thousands of refugees fleeing impoverished–and often war torn–countries to seek a better life among the more affluent nations. As of last year, there were 435,000 registered asylum seekers in Europe. Here in America, the preferred immigrant destination, an estimated 12 million undocumented immigrants have breached our borders, a precursor of things to come, for as temperatures rise, so will the press of an increasingly desperate humanity. The connection between global warming and escalating asylum seekers? More than you may have surmised. Consider, for example, Syria’s seemingly intractable bloody civil war. Evidence exists that a prolonged drought may have contributed substantially to increased prices and fewer goods such as food, igniting demands for a solution. While correlation isn’t proof, the fact is the drought internally displaced 1.8 million of the population. /Some farmers lost 80% of their livestock. One of the problems when it comes to the matter of global warming is its time warp scenario of a distant future, making it difficult for many of us to wrap our minds around it. Not so for those who find the future intruding upon their doorstep in the here and now. I like to travel and one place I’d love to visit is the Cook Islands in the South Pacific with its coral reefs, white sand beaches, coconut palms, turquoise lagoons and teeming friendliness, fifteen tiny islands offering gargantuan oasis in a troubled world, a place where people still care about each other and go out of their way not to offend. 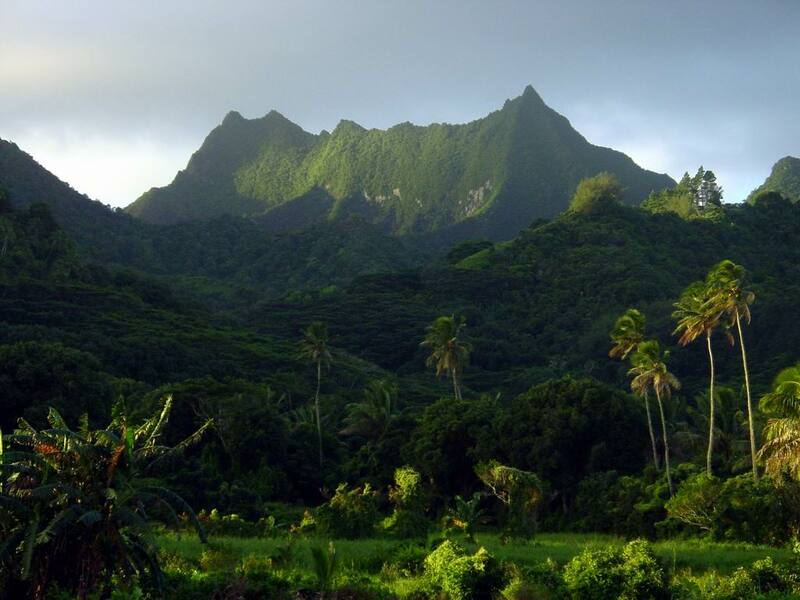 Rarotonga, Aítutaki, Atiu, Takimunu–their very names–sensuous with Polynesian rhythms–arouse my appetite for indulgence in this Lotus land in far away seas where time seems to stand still. And yet these islands of languorous ease are but one savage cyclone away from being virtually washed away in a future world of arbitrary storm violence of increasing intensity and frequency. As is, the seas continue their relentless rise. Sadly, just since 1997 the Cook Islands have suffered several devastating cyclones, heavily damaging its infrastructure, particularly the coral reefs central to the protection of the Islands’ coastal zones and lagoons with their teeming biodiversity. Much of the Cook Islands’ income depends, of course, on tourism and the viability of these reefs and lagoons. Consider the looming fate of Tuvalu, another South Sea nation of nine atolls covering 26 square miles. Experts say that in the next 50 years Tuvalu’s entire population, currently 12,000, will need to be evacuated. Already Tuvalu’s agricultural land has been compromised by progressively higher tides and you can see vistas of palm trees embedded in deep water. New Zealand has promised to take-in all its people, so they are at least fortunate in that regard. Not so nearby island nations like the Cook Islands, Fiji, Marshall and Solomon Islands. In the meantime, coastal erosion and inundation of crop lands has taken on regularity rather than exception. Many islanders are already choosing to leave, but where can they all go, some 5 million in all? Ask these islanders if global warming is real. Being on the frontline, they should know. Such a very good point you bring up!